WP-CLI is used to manage WordPress installations with a set of command-line commands. Although WordPress is well known for the easy to use installation and user interface, some people still prefer managing it with a command-line tool. WP-CLI is the most commonly used command-line tool made for WordPress and it is easy to learn and use. Let’s start off with a little introduction to WP-CLI first. As a WordPress user, you’ll most likely be aware of the fact that its popularity makes it the favorite target for hackers. Perhaps, you may choose to install plugins that can heighten your site’s security against hacker attacks and vulnerabilities. But, do you know which security plugin should you install? Or how many plugins you’ll require to protect your site? And so on. 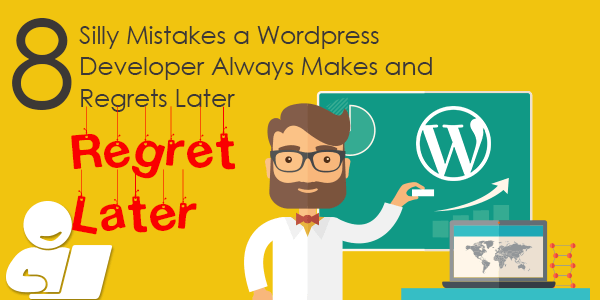 An unfortunate reality is that the majority of WP users fail or don’t try to understand the scope of each WordPress security plugins and what role it plays. Through this post, I’ll help you understand some important things you should keep in your mind, before selecting a plugin for your site. But, let us look at the current scenario of the WordPress plugin ecosystem. 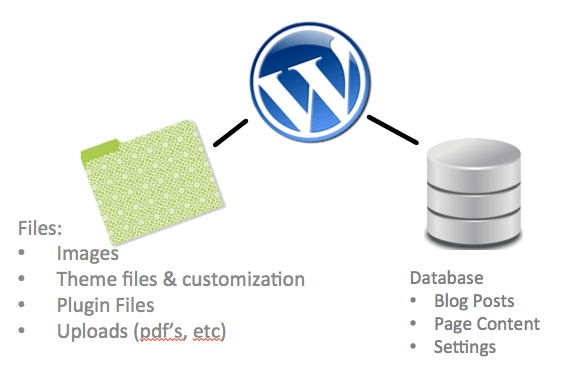 WordPress is the leading content management system second to none. The others like Drupal and Joomla are not as popular but they have their place in the market. The thing about WordPress is that it has become so popular. The community has been growing over the years making it possible for people to access information concerning WordPress with such tremendous ease. Whenever you have a problem you can always find information online to help you resolve the issue. The same cannot be said about Drupal. It is a bit harder to understand when compared to WordPress. From the last few years, most of the website owners are using the advanced features to make their site visually engaging and inviting. If you are also looking for an excellent option to enhance the design of your site, then you should create and develop your website on WordPress. WordPress is an excellent Content Management System and blogging platform that comes with thousands of astonishing themes and plugins that allows a user to craft a fully-featured websites for their businesses. If you are a newbie WordPress user, then you can allow the theme to enhance the look and feel of your website’s design. With the help of WP themes, you can create an eye-arresting, engaging and professional looking design that can help you get more visitors with ease. In fact, you should give more importance to your site’s design than your content. WordPress is the most widely used CMS all across the Globe. It has always been the industry leader, topping the popularity charts ever since its introduction. In fact it is surprising that the WordPress is so far ahead in popularity that the next most popular CMS on the list comes nowhere even close to it with its market share. WordPress stands at an impressive 60% and Joomla at a mere 9% of CMS market share as per 2014 figures. What attracts users towards WordPress is that it is easy to use and even beginners are able to use it without much training. WordPress has been around since 2003 and it is not difficult to find online tutorials which help users to use it and create their websites. Over 60 million websites today depend on WordPress for publishing and managing their content, which highlights the fact that WordPress is not only used by novice bloggers but by professional web developers as well. In recent years, Retina or HiDPI Display has been one of the most discussed topics among web designers and developers. With more and more high resolution devices are being introduced to the market every year, it has become quite crucial to get your WordPress site ready for retina displays. Like others, this site has been upgraded to WordPress v4.2 automatically. So let’s take a look at what you can expect! The newest version of WordPress is 4.2, named after American jazz Pianist, Bud Powell. This is big update after some minor update to fix the security holes and small improved but this release has nothing too groundbreaking. After few days for testing, I write some notes about the latest version of WordPress to share my thoughts on the main 4.2 changes. What’s news in WordPress v4.2 which we’ve expected? Short answer: WordPress 4.2 focuses on communication, sharing, and simplicity. 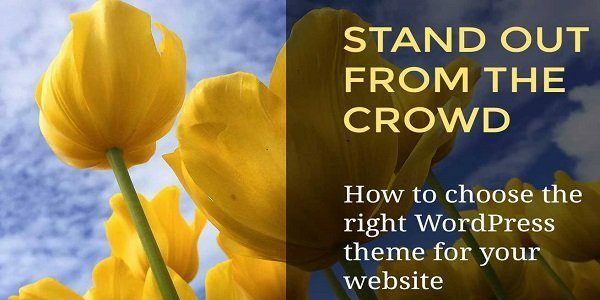 It is easy to find a premium theme for your website, but usually you will have to pay quite a high price for one. March was a month loaded with a lot of amazing WordPress themes releases. Here are round up of the best WordPress themes released in the month of April, 2015. I would like to make it easier to find the best WordPress themes what you are looking for? 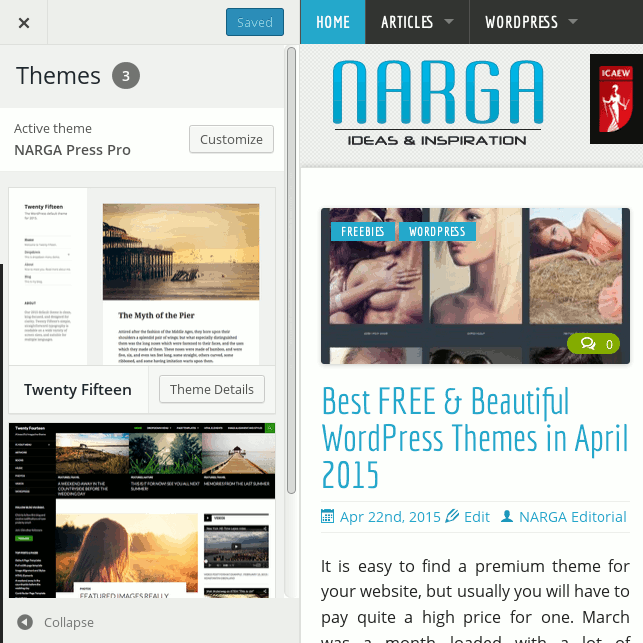 NARGA.NET has been focused on List Post Type of WordPress themes and plugins. I regularly write articles listing the most downloaded, beatiful and high quality free WordPress themes and plugins. However, you don’t really see versions of this list for premium plugins. I’ve got a lot of email to ask me about the best items to help they buy and use them. I don’t want to say that Free WordPress themes are not good. But, Free themes have their own limitations and disadvantages.